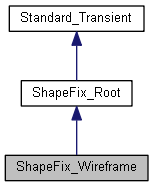 Provides methods for fixing wireframe of shape. Auxiliary tool for FixSmallEdges which checks for small edges and fills the maps. Returns True if at least one small edge has been found. Fixes small edges in shape by merging adjacent edges If precision is 0.0, uses Precision::Confusion(). Fixes gaps between ends of curves of adjacent edges (both 3d and pcurves) in wires If precision is 0.0, uses Precision::Confusion(). Get limit angle for merging edges. Loads a shape, resets statuses. Auxiliary tool for FixSmallEdges which merges small edges. If theModeDrop is equal to Standard_True then small edges, which cannot be connected with adjacent edges are dropped. Otherwise they are kept. theLimitAngle specifies maximum allowed tangency discontinuity between adjacent edges. If theLimitAngle is equal to -1, this angle is not taken into account. Returns mode managing removing small edges. Set limit angle for merging edges. Decodes the status of the last FixSmallEdges. OK - No small edges were found DONE1 - Some small edges were fixed FAIL1 - Failed to fix some small edges. Decodes the status of the last FixWireGaps. OK - No gaps were found DONE1 - Some gaps in 3D were fixed DONE2 - Some gaps in 2D were fixed FAIL1 - Failed to fix some gaps in 3D FAIL2 - Failed to fix some gaps in 2D.